The wind blew down the dark alleyway. Five years ago there once was a chicken called Caw-Caw. He would wait until you slept and then creep into your room. He would then caw his loudest to wake everyone up in their room. One night he went into an angry granddad’s room who chopped his head off! Henry, the legally blind hedgehog, heard the screams and ran into the house, up the stairs, and into the granddad’s room. He didn’t really see much but he could tell something was wrong. 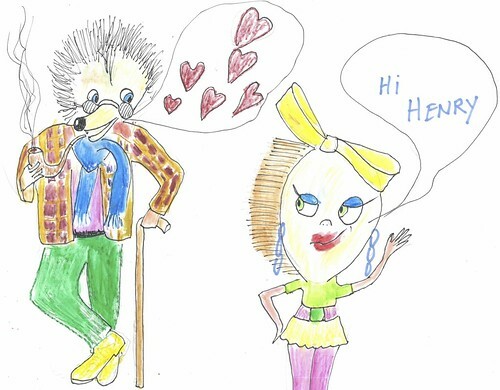 He tried to get rid of the granddad by letting off but when he did he fell over a hairbrush and then also fell in love. 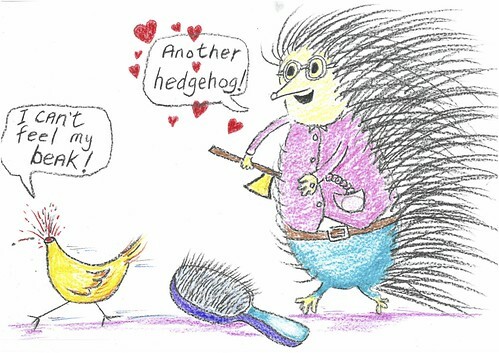 “Another hedgehog!” said Henry, but little did he know that the hairbrush wasn’t a hedgehog but just a hairbrush called Hairietta! “Why are you running around like a headless chicken” shouted Henry.